Here at the Harlem Center for Aesthetic Dentistry, we've helped countless people in New York City smile with confidence after they've been missing teeth. While dental implants are an ideal solution for missing teeth, many people benefit simply from the placement of a traditional dental bridge. A bridge refers to a type of dental appliance that helps fill the gap left behind by a missing tooth or a few missing teeth. The bridge clasps around teeth that are adjacent to the tooth gap, securely bracing itself in place so patients can bite, chew, and smile with renewed confidence. The bridge can be removed with ease for cleaning. Good candidates for dental bridges are people who are missing a tooth or a few teeth and have enough tooth structure adjacent to the tooth gap. Bracing around other teeth is crucial for the success of a dental bridge. Patients should understand the proper cleaning and care for dental bridges so they can prolong their bridge's life for many years ahead. The extent of a person's tooth loss makes a major difference when it comes to candidacy for a bridge. If a patient is missing many or most of their teeth, they will not be eligible for a dental bridge any longer. This is when a partial denture or a full denture will be a much more suitable solution. 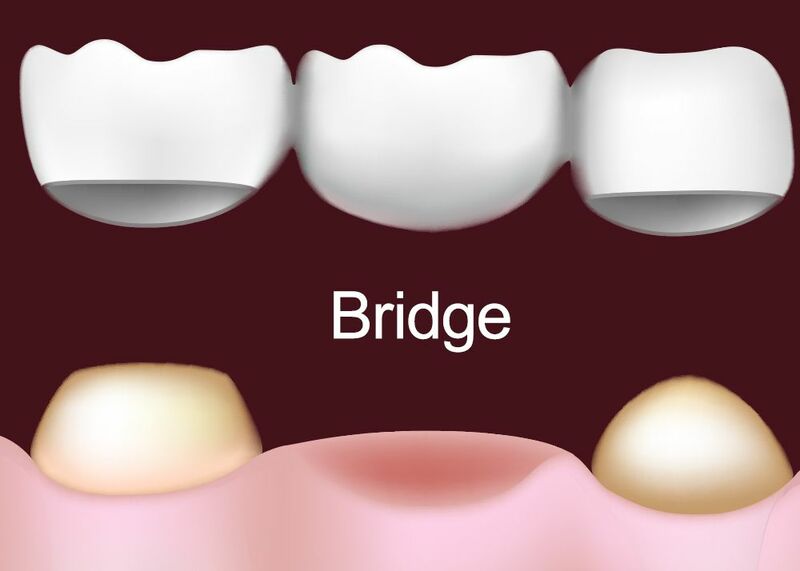 A fixed bridge refers to a bridge that is supported by dental crowns. The crowns are located on either side of the bridge and physically cap the teeth that are on either side of a tooth gap. The bridge is secured, allowing people to bite and chew as they normally would with added stability. Ideal candidates for fixed bridges are people who have teeth adjacent to their tooth gap that are healthy enough to be capped with a crown. In essence, the location of the tooth gap makes a major difference when it comes to eligibility. Implant-supported dental bridges refer to dental bridges that are held in place with dental implants. These are artificial tooth roots that are surgically embedded into the jawbone and gum tissue. They function just like natural tooth roots and offer an unmatched degree of stability and strength for a dental bridge. Good candidates for implant-supported dental bridges are people who have sufficient jawbone and gum density along their tooth gap. This will be necessary to support and fuse around the implants. Patients should also be healthy enough to undergo an oral surgery without experiencing adverse side effects or health issues. What Kind of Dental Bridge Is Right for Me? The best way to find out what kind of dental bridge is ideal for you is to stop by for a consultation. We can discuss all of these matters in much greater detail and answer any questions you may have about your dental treatment options. For more information about dental bridges and whether or not they are ideal for you, be sure to contact our advanced dental care center today. The team at Harlem Center for Aesthetic Dentistry is here to help you smile with renewed confidence.